"What needs to be used up in the fridge?" We had half of a head of cauliflower (olive oil, salt, pepper, roasted at 450F for 15 minutes), three carrots left in the produce drawer (sliced on the bias, olive oil, salt, pepper, herbes de provence), the last of the French lentils (1 1/2 cups with enough water to cover by 1", pressure cooked 20 minutes at 7.5pps) and four cups left of the vegetable stock. 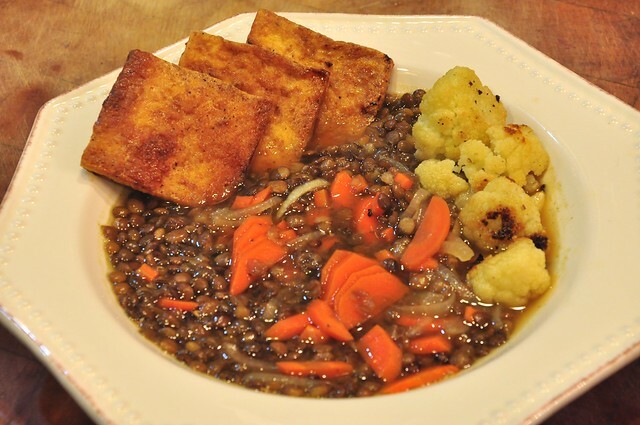 Start with a base of onions and garlic, add in the carrots, deglaze with a 1/4 cup of white wine, drop in the cooked lentils, veg stock and a shot of tamari and bring to a simmer for 10 minutes to marry the flavors. Rounding out the bowl was the roasted cauliflower and pan-fried tofu (cut in squares, pan-fried in olive oil about 5 minutes per side, finished with a shot of tamari). Tonight was Einkorn flour experiment number three, involving bao, or steamed buns. They were filled with oolong-smoked tofu cooked with a homemade hoisin sauce (tamari, agave, sriracha, black vinegar, sesame oil, garlic, ginger, thickened with a water/cornstarch slurry), shredded carrot, napa cabbage, bell pepper and pickled cucumber. 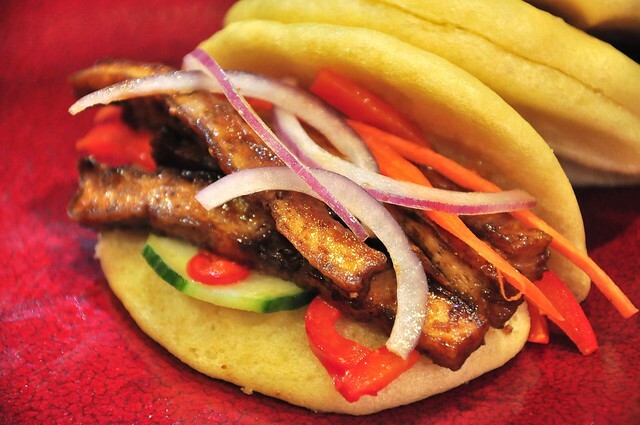 Light, fluffy and full of flavor, this yeasted dough exceeded our previous bao experiments by a large measure. The old saying "the sum is greater than the parts" applies to this comforting bowl of food. The polenta started with 1 cup of fine cornmeal whisked into 4 cups of boiling water seasoned with 1 tbs. of salt. From there we turned down the heat to low and made it like a risotto, adding an additional 2 cups of water, about 1/3 cup at a time here and there (don't sweat the timing, just don't let it scorch the bottom of the pan). Finally, we stirred in 1 tbs. of soy margarine, 1/4 cup of microplaned Smoked Cheddar Sheese, 2 tbs. of nutritional yeast, and 1 tsp. of black pepper. Cook for an additional 3-4 minutes, and check for seasoning. The tofu was smoked in our stovetop unit with hickory chips for 25 minutes, then marinated: 2 tbs. olive oil, 2 tbs. tamari, 1 clove of garlic smashed, 1 tsp. agave, 1 tsp. ketchup and freshly ground black pepper to taste. While the tofu was grilling (about 4-5 minutes per turn on the first side, 3-4 minutes per turn after the flip), it was basted with the remaining marinade. One large onion, cut in thick slices, slowly cooked on low heat in 1 tbs. of olive oil for 10-12 minutes. Seasoned with salt and pepper. Optionally, you can add a pinch of sugar if you want a little more color, but these didn't need it. The Brussels Sprouts were trimmed and cut in half. The pears were cut in half, the seeds taken out with a melon baller, then cut in 1/4" slices. They were both added to the roasting pan, tossed with olive oil, salt and pepper and roasted for 15 minutes at 450°F. ...and now, number 5, the larch a look back at every dish from 2011.
for those of you scoring at home, the music track (991218) is a (modded) Roland CR-8000 clocking an EH Microsynth and Roland SYB-3 pedal through a Maestro Phaser played live to tape. 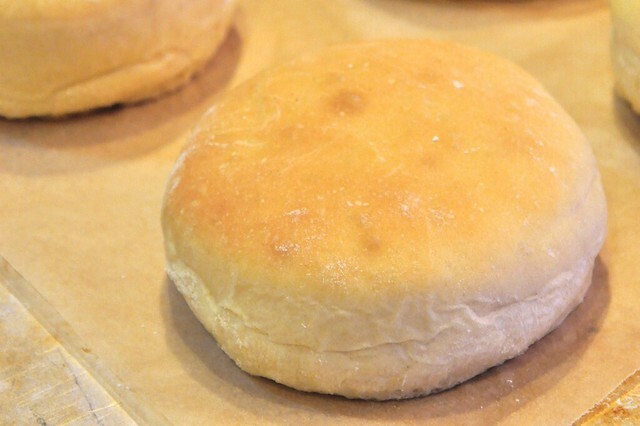 We experimented again with the Einkorn flour, this time making the burger buns (a yeasted dough) -- and, as you can see, they turned out really well, with a slight yellow-ish coloring and a fantastic flavor. They had an ever-so-slight crust on top and were well-structured through-out and held up to multiple condiments, lettuce and pickles. Here's the recipe for the burgers. 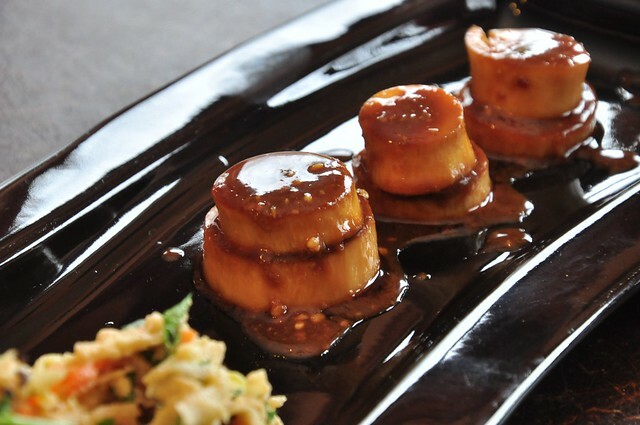 You can also make these as sliders and they will hold in a low oven if needed. Pressure cook the brown rice (22 minutes, first ring) while prepping the rest of the ingredients. 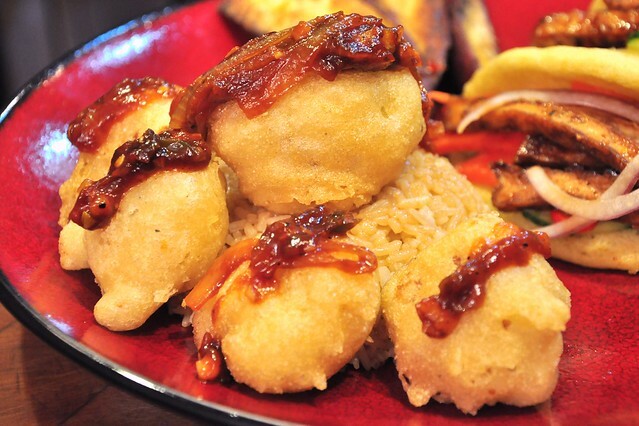 The brown basmati or jasmine are essential because of their "stickiness" which binds the burgers together. In a large saute pan over med-low heat, add 1 tbs. olive oil and cook the sliced onions slowly with a pinch of salt until well cooked and golden brown, about 5-7 minutes. Add the garlic and optional jalapeno and cook 1 additional minute. Add the black pepper, smoked paprika, chipotle and cook 1 additional minute. Add the cooked rice, Daiya, peas & pumpkin (or sunflower) seeds and mix to combine. Don't be gentle, mash the hell out of it if you like. ;) -- or put half of it in a food processor. Check for salt. Remove from heat and place in a large bowl and let cool slightly. 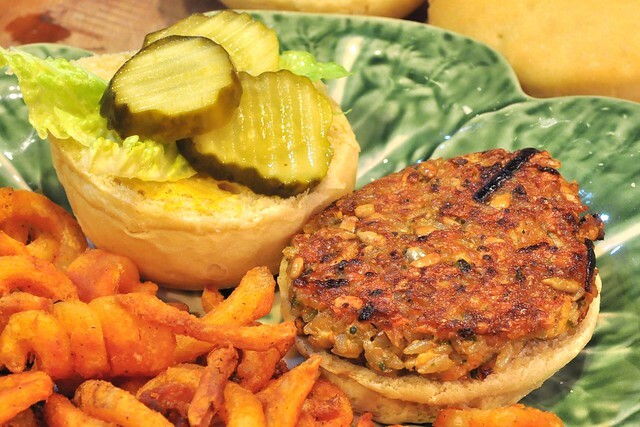 Form the burgers into patties and cook in a cast iron pan (regular or grill pan) with a little olive oil until golden brown on both sides. We picked up some cauliflower this week, and decided to make Indian tonight. 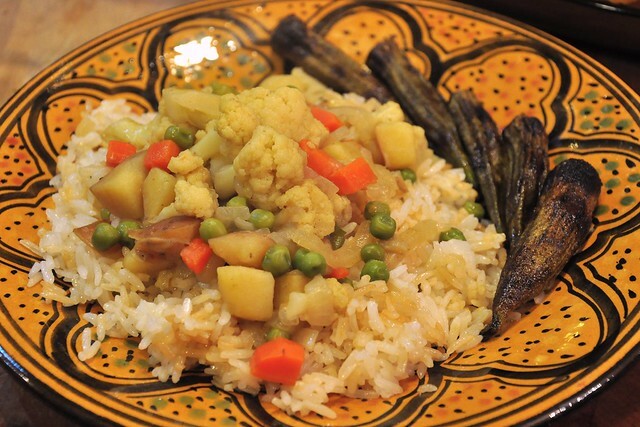 We decided to do a slight riff on Aloo Gobi -- cauliflower, potato, peas & carrots in a scrumptious ginger, garlic and garam marsala scented coconut milk broth, served over basmati rice. Sharing the plate was grilled okra -- trimmed and marinated with olive oil, tamari & pepper, then grilled. 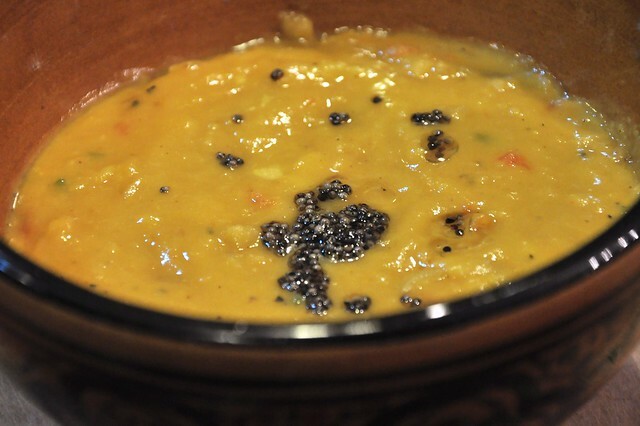 Staring us off was a hearty bowl of toor dal -- yellow split peas -- pressure cooked with ginger, garlic, turmeric, salt & pepper and topped with fried curry leaves and black mustard seeds. Pairing with the dal was something different -- we've been trying out a new type of flour this week -- Einkorn -- and tonight we used it to make the puri. As you can see, they looked the same, acted the same, and I can't quite put my finger on why yet, but it tasted... better. 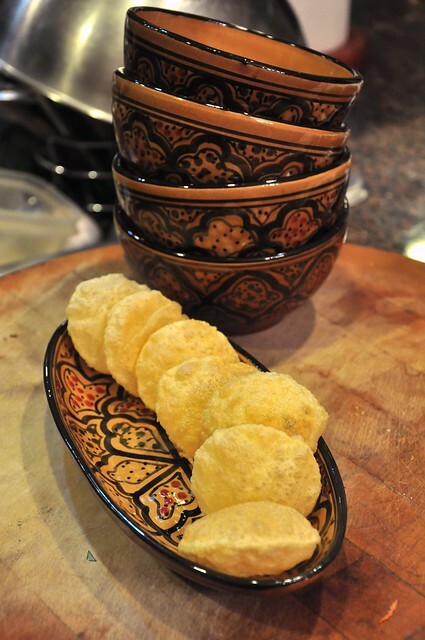 The einkorn gave the puri a slightly crisper edge, but with a softer mouth feel when chewing. We all liked it very much and found it extremely interesting... clearly more investigation is required. 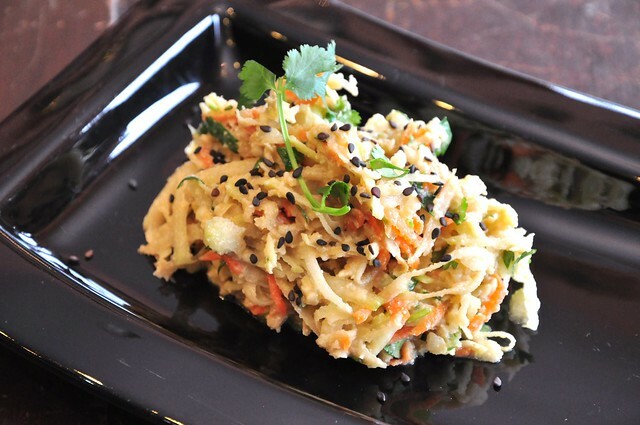 A second luncheon helping of the wonderful parsnip noodles from Matthew Kenney's "Everyday Raw Express." We used our "spiral cutter gadget thingy" (a.k.a. 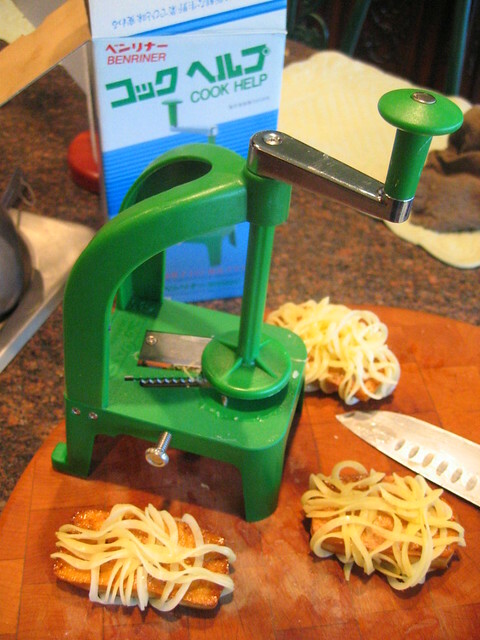 "Cook Help") for turning the parsnips into noodles, here it is from 2006 when we were turning potatoes to be wrapped around tofu. I almost forgot to upload this beauty -- a gluten-free cake resplendent with chocolate and orange flavors. 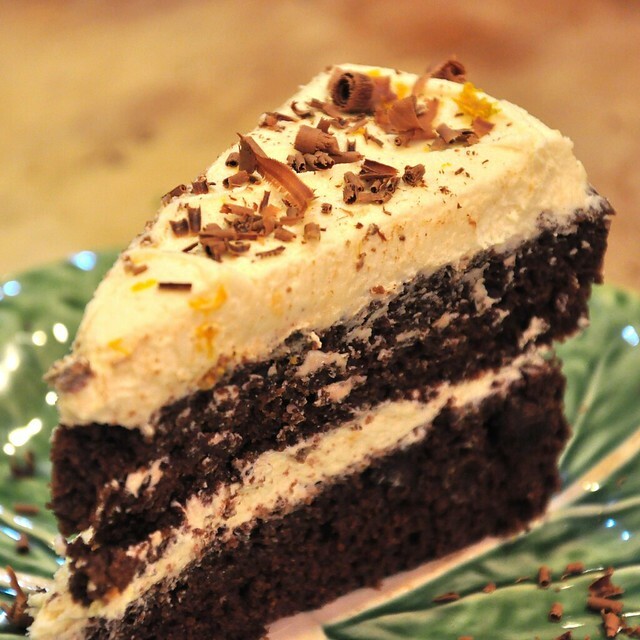 Liz adapted the cake based on the gluten-free basic chocolate cake, with the addition of orange zest, juice and extract, from Kris Holechek's "Have Your Cake And Vegan Too." 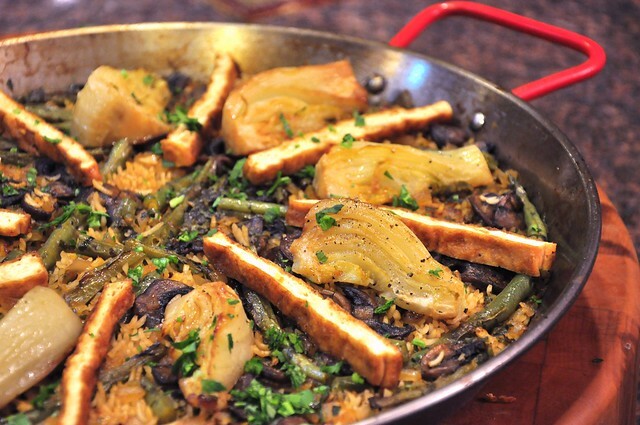 We made Paella (recipe) with fennel again -- using smoked tofu, green beans and mushrooms to round out the pan. 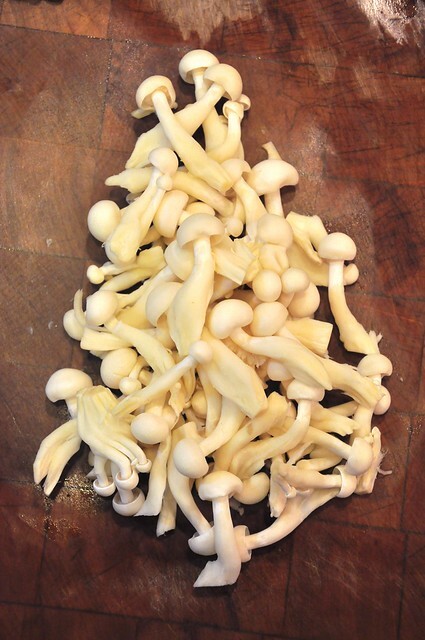 Both recipes came from Matthew Kenney's "Everyday Raw Express"
We love king trumpet mushrooms -- and this recipe uses the mushroom stalks marinated for 30 minutes in a BBQ sauce of miso, nama shoyu, agave, apple cider vinegar, lemon juice and sesame seed oil. As an experiment, we took a few extra mushrooms and dehydrated them for an hour at 105°F -- which turned out exceptionally well! 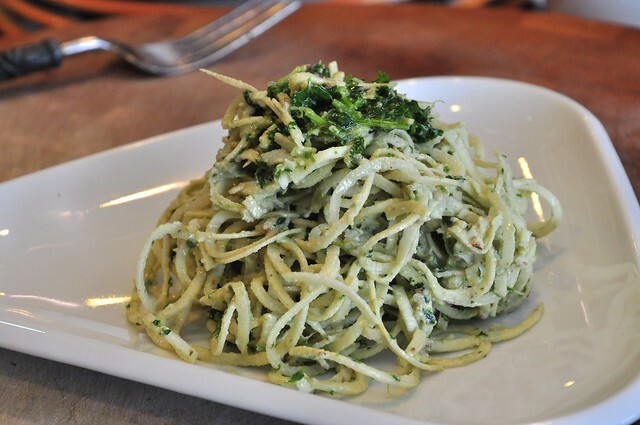 Pairing up with the BBQ, we peeled and spirialized a parsnip into noodles and combined them with a pesto of walnuts, cilantro, lemon juice, salt, jalapeno and olive oil. 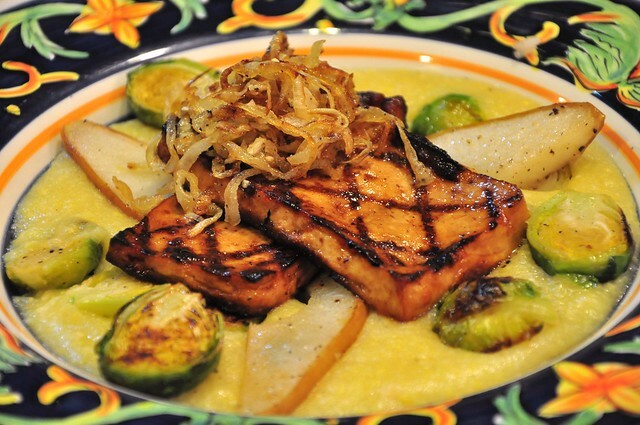 The tofu (16oz. / extra firm) was smoked (mesquite wood chips, 30 minutes), then marinated for 30 minutes: 1/4 cup beer, 2 tbs. vegan sour cream, 1 tbs. tamari, 1 tsp. minced garlic, a shot of your favorite hot sauce and a pinch each of cumin, sugar & pepper. From there it was dredged in a mix of 1/4 cup of ground pumpkin seeds, 2 tbs. of cornstarch and 1/4 cup of instant masa (we used Maseca). It was deep-fried in a wok with canola oil (375°F) for 2-3 minutes per side until golden brown. The tofu was removed from oil and drained, put on a sheet pan with a rack and baked for 10-15 minutes at 350°F -- this finished cooking the inside of the tofu. While the tofu was baking we made the sauce: 1/2 cup of vegan sour cream, 1 tsp. lime juice, salt & pepper to taste, and 1 tbs. of olive oil blended together in the vita-mix. 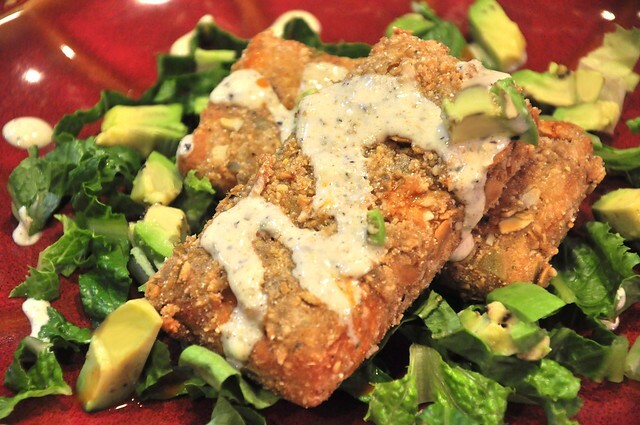 The crusted tofu was served hot on a bed of shredded lettuce with avocado & topped with the sauce. 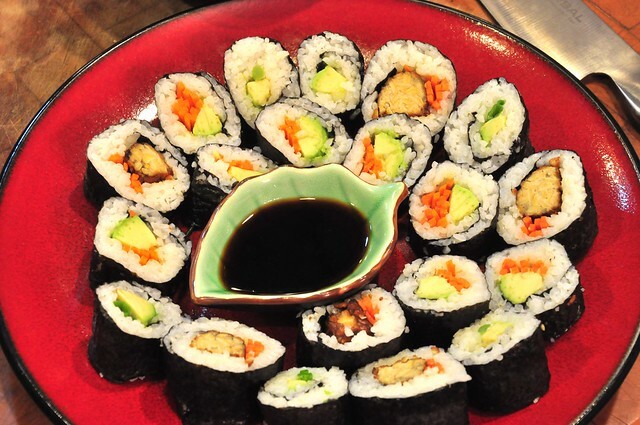 We haven't made sushi in quite a while, so it was a real treat tonight! 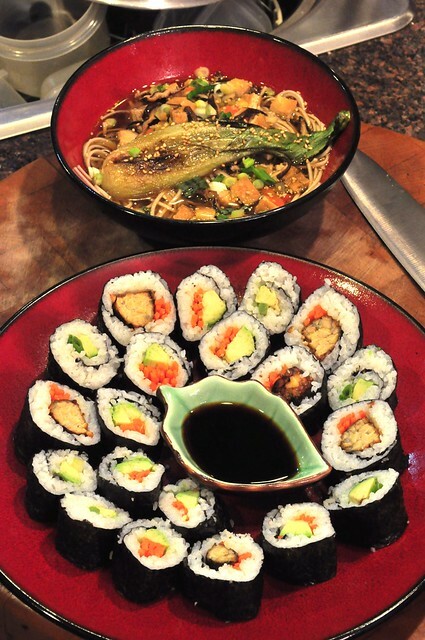 We made two types of rolls: carrot, scallion and avocado, as well as deep-fried tempeh and avocado. The tempeh was cut into 4 long strips and placed in a saute pan filled with water and 1 tbs. of tamari until it reached halfway up the side of the tempeh. It was brought to a boil, reduced to a simmer and a lid placed loosely on top until the water evaporated. Then the tempeh was removed (carefully) from the saute pan and deep-fried in canola oil -- 375°F for 2-3 minutes. 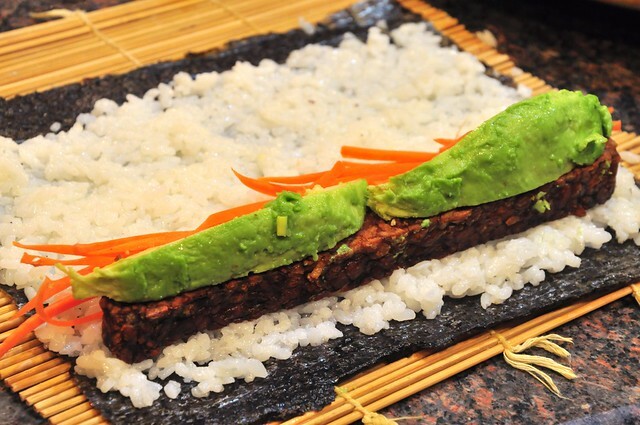 From there it was added to the base of the roll with the avocado and other veggies. The ramen used our shiitake mushroom stock, enhanced with kombu, yellow miso, garlic, ginger and black pepper. 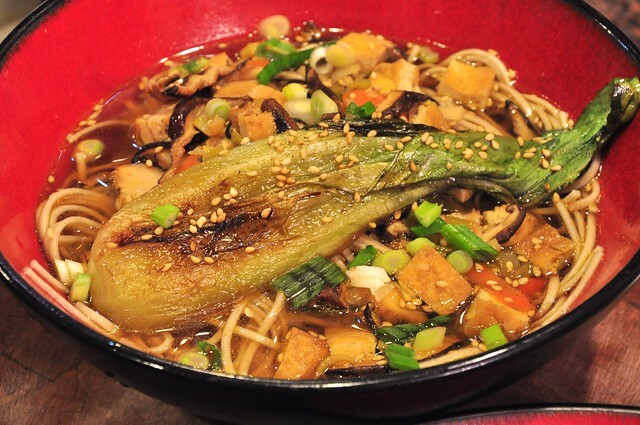 Rounding out the bowl was black tea smoked tofu, shiitake mushrooms, leeks, carrots and udon noodles, all topped with scallions and the braised baby bok choy. The bok choy was cut in half, seared on both sides, then we added a splash of tamari and water, turned the heat to low and put a lid on to cover for 5-7 minutes. Finished with toasted sesame seeds. 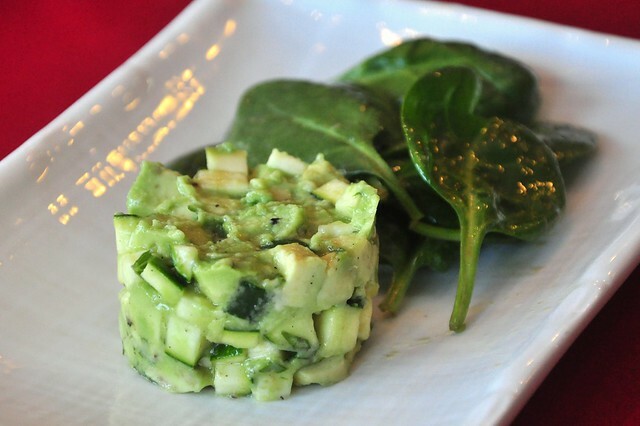 The recipe is from Matthew Kenney's "Everyday Raw Express" -- diced zucchini, avocado, lemon juice, olive oil, basil, chives combined in a ring mold. Served with a spinach side salad (lemon juice/olive oil vinaigrette). 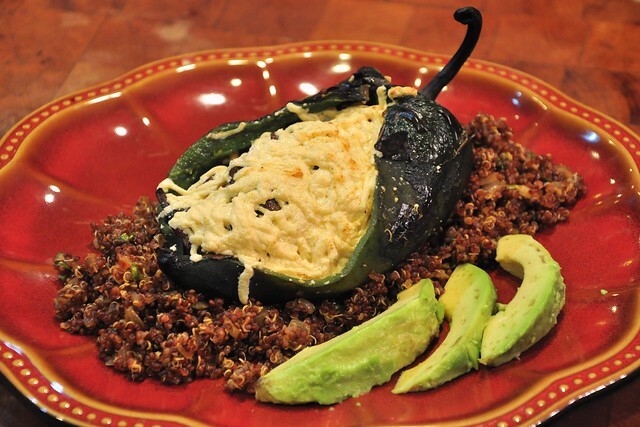 The poblano was placed right on the burner cranked up to medium-high and turned until well blackened. From there they were put in the microwave (instead of a paper bag) for 10 minutes and then peeled and de-seeded. They were stuffed with a mixture of black beans (onion, garlic, Mexican oregano, smoked paprika, salt, pepper, black beans) and potatoes (boiled, cut into cubes, pan fried in olive oil) with Daiya on top. The rellenos were finally place under the broiler for 2-3 minutes until the Daiya melted. The red quinoa was soaked for 10 minutes, rinsed, then boiled for 12 minutes in salted water, drained and sauteed in a pan with olive oil along with half of an onion, garlic, Mexican oregano, salt, pepper and finished with cilantro. 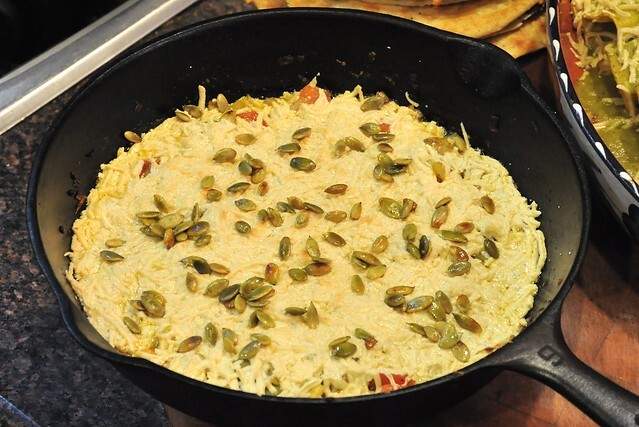 A friend of ours was recently out in Sedona, AZ and brought us back a cookbook, and although it was decidedly not vegan, it did serve as a jumping off point for the fundido (diced tomatillos, tomatoes, chiles, onions and garlic, topped with Daiya Mozzarella and toasted pumpkin seeds). 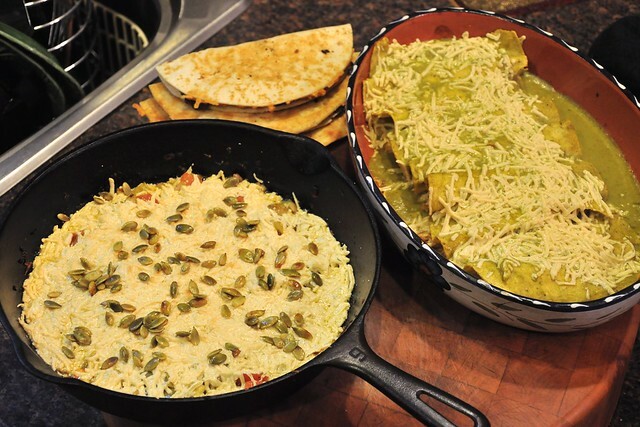 You cook all the ingredients in the cast iron pan, top it with the cheese and put it under the broiler for 2-3 minutes to melt the Daiya and finish with the pepitas -- it's then served family style with chips. 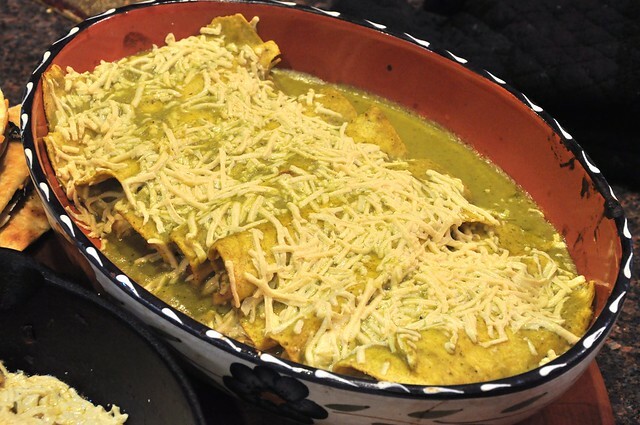 The main dish was one we've made many times before, Enchiladas. 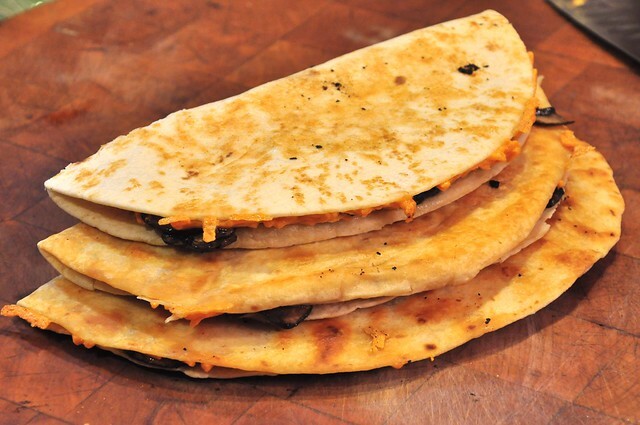 The corn tortillas are fried briefly in hot oil, the dipped in the roasted tomatillo sauce, filled with onion, smoked tofu and Daiya cheddar and rolled up, then baked with the rest of the sauce and Daiya on top.